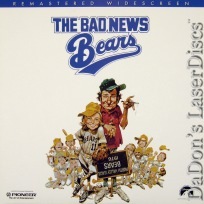 "Grand-Daddy that Spawned Kid Sport Films of 80s and 90s"
The Bad News Bears 1976 - 102 min. 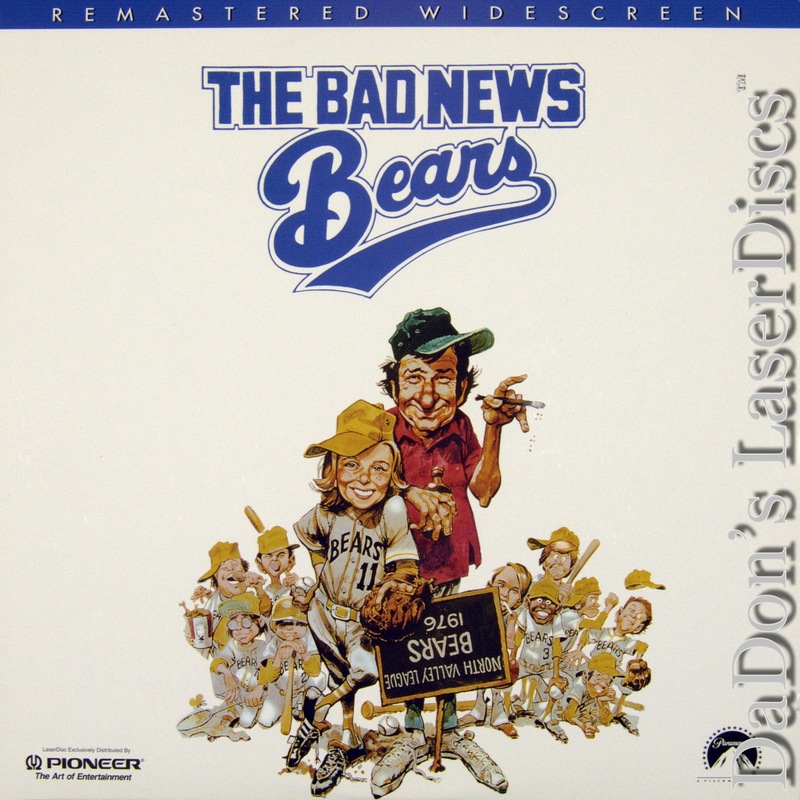 - Color Genre: Comedy Rated PG Country: USA LaserDisc Movie Storyline: One of director Michael Ritchie's most universally recognized comedies, THE BAD NEWS BEARS is a film that continues to entertain audiences of all ages. The story concerns a hopeless Little League team that eventually scores big when it acquires a new coach, Morris Buttermaker (Walter Matthau), a grouchy, beer-guzzling pool cleaner who takes the position for some extra cash. When he realizes that his players are a bunch of talentless misfits, he signs up two secret weapons: Amanda Whurlitzer (Tatum O'Neal), the daughter of an ex-girlfriend who also happens to be an awesome pitcher, and Kelly Leak (Jackie Earle Haley), a motorcycle-riding punk who is inarguably the best player in the area. With their new lineup in place, the Bears breeze their way into the championship game, in which they must battle their rivals, the Yankees, in order to exact revenge and win the title. Matthau's Buttermaker is a gem of a character, tossing off cynical one-liners with a vehemence that is truly hysterical. Ritchie strikes further gold with his youthful cast, who all embody their characters with a comic realism that is both heartwarming and humorous, making THE BAD NEWS BEARS one of the finest sports comedies ever made. LaserDisc Movie Review: The success this underdog comedy from director Michael Ritchie almost single-handedly spawned the kids' sports film boom of the 1980s and '90s. When beer-breathed ex-minor-league ball player and professional pool cleaner Morris Buttermaker (Walter Matthau) agrees to coach a Los Angeles little league team, he soon finds he's in over his head, having inherited an assortment of pint-sized peons and talentless losers. They play well-organized teams and lose by tremendous margins, and the parents threaten to disband the Bears to save the kids (and themselves) any further embarrassment. Buttermaker refuses, though, and brings in a pair of ringers: Amanda (Tatum O'Neal), his ex-girlfriend's tomboy daughter, and Kelly (Jackie Earle Haley), a cigarette-smoking delinquent who happens to be a gifted athlete. With their help, the Bears manage to change their losing ways and qualify for the championship, where they face their arch-rivals, the Yankees. 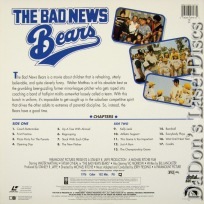 --- Jeremy Beday Bad News Bears is one of the most delightful blends of family and adult entertainment ever made. The underdog-made-good story may please and kids in the audience, but it's only one facet of the film's entertaining, realistic portrait of little league baseball. The real appeal comes from spot-on performances by Tatum O'Neal and Walter Matthau. Their relationship, as a grizzled divorce and the pubescent girl trying to make him her father, is finely tuned and immensely enjoyable. Their natural stubbornness yet vulnerability comes through, helping to keep the story out of the realm of the sentimental. The entire script, by Bill Lancaster, is full of authenticity, capturing both the different personalities of the kids and the often embarrassing and bizarre world of Little League. Director Michael Ritchie achieves all of the story's drama without losing any of the innocence of the youngsters. 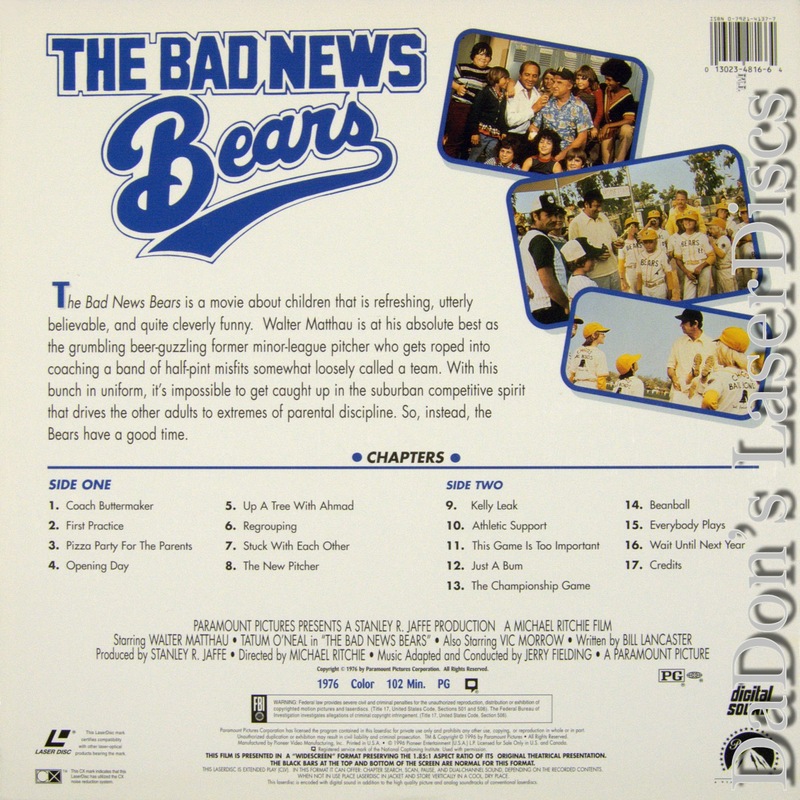 Considering that his three previous films (Prime Cut, The Candidate, and Smile) were all distinctly adult fare, Bad News Bears was a surprising movie from Ritchie. But he brings his mature sensibility to his characters, never expecting them to be perfect but never judging them either. --- Brendon Hanley Thanks for Visiting DaDon's Rare LaserDiscs ! Reviews, Articles, Newsletter and Information for Movies on LaserDisc LD Laser Disc, LazerDisc.